Our Fairline Phantom 46, ”Deep Blue” is based in Port Calanova (Berth E53). An exceptionally spacious flybridge cruiser. She has one double, one twin cabin and one bunk. 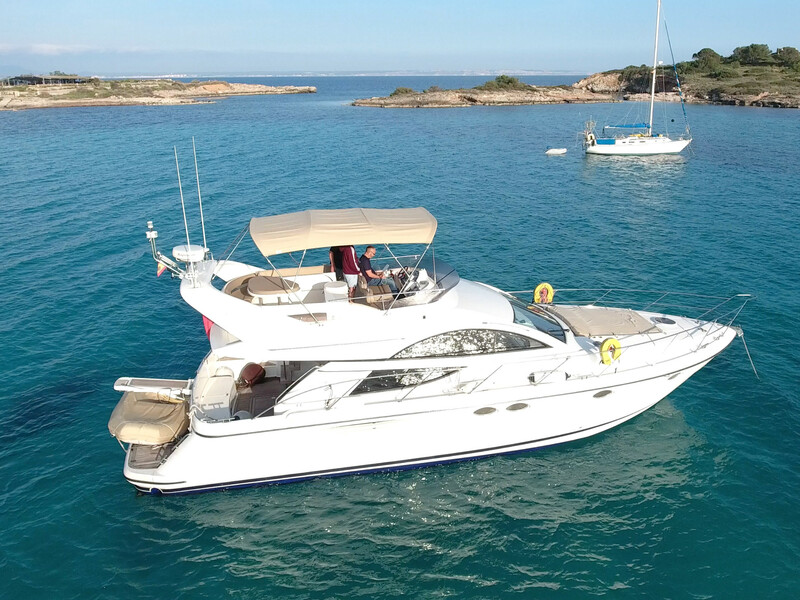 Designed for cruising the gorgeous Balearic Islands with the capacity of 8 guests in addition to a skipper and a stewardess. Deep Blue is brand new to the charter market for 2019. "Deep Blue is just a wonderful boat, she's spacious, modern, drives like a dream and you will have lovely memories to go home with. She has a sunbathing area on the bow, a decent sized aft area with tables and chairs and a fabulous swimming platform, the kids can jump off for a swim and easily get back up with the ladders. She also has a tender, you can be anchored off one of our beautiful bays and also have access to get back to land. The boat is fully Air-conditioned, has a fantastic sound system, its own WI-FI, flatscreen TV, barbecue, fridge and dinning table on the flybridge." - Sammie 01 March 2019.